• Do you sabotage yourself? • Is there something that you need to, but you just don't do it? • Wouldn't it be great to get past the block and take action with ease? 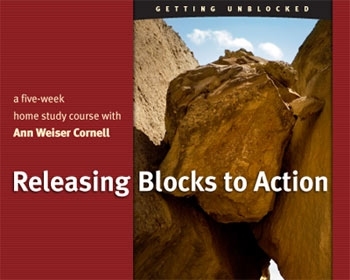 In this five-week course, Releasing Blocks to Action, you'll identify your block, relate to it in a new way, and release the dynamic that holds the block in place. The result: flowing action in alignment with your true self. Taken from Ann's popular phone course, this 5-CD set includes all the exercises and detailed explanations for how to use this powerful method. Ann takes you step-by-step through the “releasing blocks” process, from identifying your reluctant and impatient parts to listening deeply to what they're wanting and not wanting. You'll learn about the four patterns of action blocks, including the Pattern of Protection and the Pattern of Rebellion, and how to tap into the life energy that's bound up in the block itself.